This thread is actually a poll to collect your requests on extra fields in LapTimer v15.1 / v16.0 timer views. On the pictures below, you see a feature I have just implemented: the tab bar slides out (to the bottom) if not used for some seconds. In the portrait timer views, this frees up space for another row of data I can add. Please reply here with your requests naming both the data (use one of the existing gadget titles, or define a new one), and the view(s) you want to see the data to show up in addition to the existing. New fields I plan to provide are Lap# and physical GPS update rate (opposed to the effective update rate as shown currently). Background information: This is actually a preparation for landscape views. Tab bars are extremely space consuming in landscape views (same height, but much wider). This is the reason I need to hide them anyway. As a positive side effect, portrait views benefit from this feature. But predictive lap timing is included already in the Timer view? What additional field do you mean? Thanks! Predictive laptiming is implemented in a different manner in other products, and it's really exciting / useful ! For example, the PerformanceBox indicates in real time the gap between your current lap and your best lap. 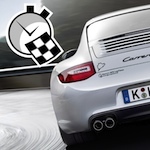 - Choose any previous lap as a reference lap time (for example to begin a track day with the best lap we did in the previous track days). Predictive Laptiming is very accurate and useful in PerformanceBox but does not allow us to load a reference lap of our choice and improve it : the loaded reference lap becomes fixed and we can't unfix it, quite crappy ! Thank you very much Harry ! What these guys name predictive timing is implemented in LapTimer since version 5.0(!) - that is actually back in the old PalmOS times. As LapTimer's implementation is exactly as described, you may judge yourself were the roots are. I'm not exactly sure when I released version 5.0, but is was probably back in 2006. So it seems my marketing is still weak. To clarify for you, please check http://www.gps-laptimer.de/User_Interface.html and search both for the Racer's and the Timer View. Especially the later does exactly what you request. 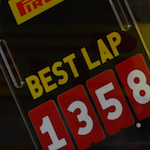 The realtime comparison between current lap and reference lap (either a set lap, the best, or the last) is done 5 times a second - which is the display update rate LapTimer typically uses. The 5 times per second are independent of the GPS used, as interpolation is used. To define a fixed reference lap, navigate into its Lap Details and press the 'Reference' button. If I may, could it be possible in the Timer View to have the relative time (the "predictive" laptiming) in a bigger font ? Or simply display only relative time, and switch to achieved lap time for 10 seconds for example once the line crossed ! So one or two big (lap and current sector for example) could be perfect ! Please check the small button showing 'Both' / 'Gap' / 'Time'. This switches between several big / small char views. 'Both' will show the minimal set very large: both absolute current lap time and lap gap to reference are displayed in large then. In addition when you pass start / finish, the last lap time will stay for approximately 10s blinking. Afterwards, LT switches to the new lap. Thank you vey much Harry, all this is already in LapTimer, that's perfect ! Anything else ? Mmmmhhhh... No ! Timer view - I would prefer this to be kept a simple as possible, but if there is extra space maybe a single OBD data field would be possible. Other people may like RPM or coolant temp in there, but if I can get OBD data working (as per my other thread) I'd like the voltage data displayed. Elises tend to burn out alternators with constant high RPM use and the dash light is not a very reliable indicator of failure. I currently have a separate device that gives a voltage readout, but integration into LapTimer would get rid of the need for that. Thought I publish some early snapshots to make this thread more vital. Please note that OBD fields always replace other views in case an OBD device is connected. I do not want to reserve space for something that is not available for the majority of users.